Bargains are only bargains if you need them. I'm sure there are some good deals, but it is difficult to see the wood for the trees. I think is just another American marketing ploy, which we could do without. . Also I feel sorry for the shop staff who often have to put up with bad behaviour from the public. Oh! I so agree with you! 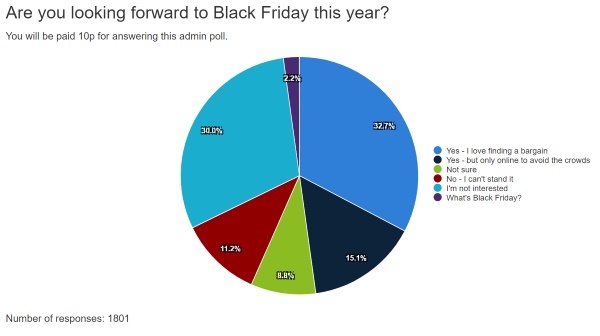 Not interested in Black Friday unless I want a specific item and then I would do plenty of research about it to get the best deal. That's what I see on the news every year since the inception of black friday in the UK, if you want something, do your research, shop around & don't be surprised if what you buy is cheaper in the christmas sales from 26th december onwards. Yes it is an American import, and we can do without. No, I have not seen the bad behaviour from the public, as I've never shopped irl on Black Friday, and because most of the "deals" we get are not that great. But the first comment here gets it more or less right - a deal can be a deal if you have that need, but it isn't if you don't. The people whinging about BF are those who have a budget for a £400 TV, see an £800 TV reduced to £600 and think 'sod it, that must be wonderful' and buy without doing any research, diligence or simple thought. People will spend an hour on price comparison sites to save £50 on a bill, but not check camelx3 or similar when they're spending just as much? Like any consumerist discount, it's of benefit to us who can actually think about such things, and an easy snag for numpties who won't. Typed on a laptop bought on last year's Cyber Monday. Has it gone down in price further since? CBA. Was it worth every penny we paid to fulfil a need? Definitely. People should be trained to not see the seller's price on an item, but to see the value of an item to the buyer. I acknowledge Black Friday as the start of Christmas. Time for the Xmas tree to be put up again. I love looking forward to when poeople start to talk about Cyber Monday, Wonky Weekend and Black Friday. Hate it, why do we have to copy every bad American idea? Much hyped bargains encourage the unwary to buy things they don't need and get themselves into debt. Entirely agree with 'theediscerning' and note that there has recently been a suggestion that money management be added to the school curriculum, though whether it will help or not I don't know. This is a great way to get rid of out of date stock that was offered at a lower price earlier in the year! We're better behaved than the yanks but BF works for me. America marketing ploy generating mass hysteria. I don'tsubscribe. I'ts only a bargain if you need it. Agree completely I dont shop on these days. Its only a bargain if you need it. Probably the item will be cheaper in the Christmas Sales. Why would I want to celebrate giving thanks for slaughtering all the indigenous population? It’s just another way to deceive the customers they are receiving a Bargain, when in fact they are being Conned . Stay clear of these sales. I don’t need anything. I only buy what I need. Found no bargains online or in store, a lot of hype but not much matter. All a hype. I would never rush to buy on principal anyway! 2 months ago by Bruciebaby.